When your Gainesville, Florida, home experiences flooding, it’s important to remove the water as quickly as possible to minimize the damage it causes. Not only are your possessions at risk, but so is your health. Water damage can lead to the growth of microbial contaminants that affect your health negatively. You might experience breathing problems that are temporary, or you might develop more serious issues. Your best strategy is to hire a company with the equipment and experience needed to conduct successful flood damage cleanup. Here are a few tips to help you ready your home or business for flood damage cleanup. As soon as you notice signs of flooding, you can take steps to minimize the damage that is likely to occur. Since it is possible that more water might enter the building, you should relocate movable items to a dry spot where you don’t expect flooding to occur. Place smaller items on top of tables and bookcases, and move pieces of furniture away from flooded areas. It’s important not to touch any electrical items if water has already reached them. However, you can go to the circuit box and turn off the power for the rooms that have been flooded, as long as you can identify which circuit breakers to switch off. If you suspect that the flooding might continue, such as when the water is coming from the outside (storm water or rising level of a nearby river), you can disconnect electronic items that have not yet been touched by any moisture. If you have an existing sump pump, make sure that it is working. You can also use buckets to remove as much water as possible on your own. If the flooding is minimal, a mop can be used to clean up standing water. 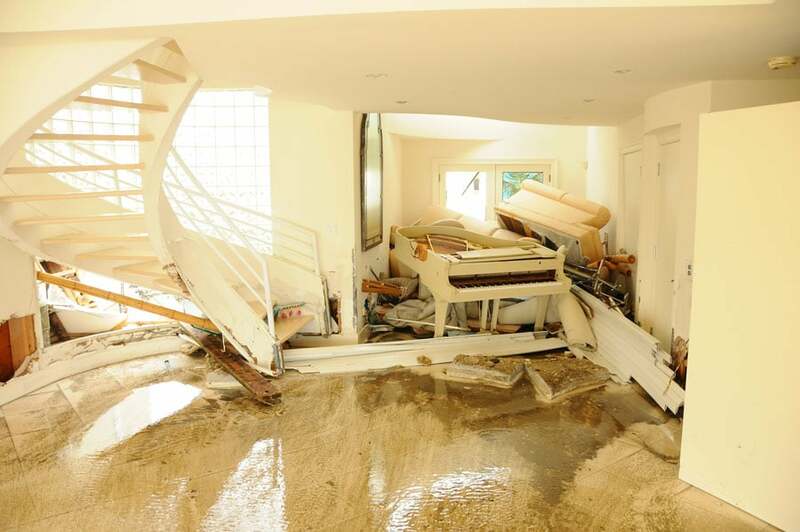 As soon as you have done what you can to protect your possessions, you should contact a water restoration company to come in and complete flood damage cleanup. They’ll remove standing water, identify affected areas and possessions, eliminate moisture, and disinfect your home.